9/12 Project March on Washington, this Saturday. 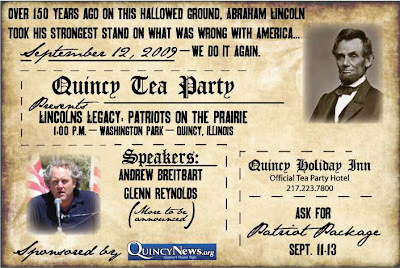 For those of us who can't make it to Washington DC, Quincy, IL is the meeting in the middle place. It's going to be huge. It's going to be exciting. And it's going to be encouraging for those of us who are driven to get our country back, to force Congress to hear our voices and to join together in one voice of We The People to demand that the United States Constitution remains the Law of the Land. "They" will hear us. Please come out and join us for the experience of Patriotism like you've never seen before.